Hi my name is Katie. I was born and raised in San Antonio and schlepped off to Boston after graduating from High school. Four icy cold winters and an NCAA hockey championship later I graduated from Boston U (not to be confused with Boston College) to return back to the warm Decembers of San Antonio for medical school. In my spare time (since we have so much of it) I like to write, bake, make arts and crafts projects, and listen to country music J. Why do I want to go to Ethiopia? Not a day goes by where I wonder how I am where I am today. People say that college and medical school is a crucible in that one undergoes extraordinary amounts of change. Before going to college, I'd never imagined the amount of transformation I'd experience. But in retrospect, I see now that my hopes and dreams have been redefined again and again over the past 5 years. Before coming to Medical School, I was fortunate to go on a number of overseas service and learning type trips through which I learned a lot about healthcare and other cultures. My experiences abroad opened my eyes to the greater world outside the four walls to which I'd confined it. Through my time in China, Uganda, and Rwanda – the problems and successes of the world became real. However even more so – my time abroad unveiled to me deeper aspects of myself and my place in the world; it opened a door to introspection I'd never thought possible. To say that my experiences forever changed the way in which I relate to other people, other cultures, and myself would be a gross understatement. They rocked me to my core. There exist two attitudes with which we tend to approach life: as utterly insignificant beings or as effectors of change. Through my travels I learned time and time again that to adopt the former point of view diminishes our place and potential impact on the world. Yet many of us tend to embrace this attitude – that what we do is inconsequential. The truth is that each of us is one person and often it seems that what we do is nothing more than a drop in the bucket. This is how I've come to see it: A snowflake is one of the most beautiful and delicate creations; they rest on your eyelashes and melt as soon as they touch your skin. But when snowflakes stick together, they stop traffic. Each of us is one person. As cliché as it sounds, when we work together, we can achieve the improbable. If we actually put our minds to it, I am certain that we could rid the world of poverty, disease, and the other injustices that plague our planet. A few months ago I was thinking about what I'd like to do in life and in the field of medicine. And after some reflection, I decided that what I'm passionate about is helping other people experience the greater world around them and to find their place in serving it. I'm passionate about teaching and mentoring, and I'm passionate about the field of medicine. And in that moment I decided that one day I want to be able to lead groups of people to foreign countries – to help them experience, serve, and process life outside our culture and to integrate that back into their own lives. I never imagined that day could come so soon! 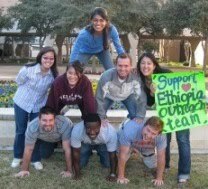 I decided that I want to lead this year's trip to Ethiopia because I love the idea of leading people overseas in acts of service and helping them to think about the impact that we can have on a culture, and the impact a culture can have on us. I believe 8 first year medical students can make a sustainable impact on healthcare in Ethiopia. And my hope is that after this trip we will see greater ways that we all can positively affect change and eradicate injustices in healthcare. Perhaps I sound like a romantic or an idealist. But to quote my favorite John Lennon song, "You may say I'm a dreamer, but I'm not the only one. I hope someday you'll join us, and the world will live as one."